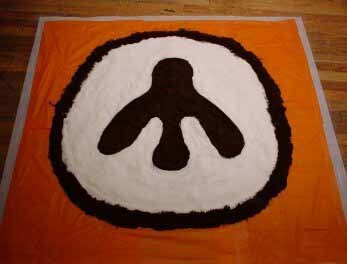 I did the installation And Sweet as Love - Mandala of Peace and Passion for Eat Art 5, held on December 1st, 2002 at HEREArt Gallery, SoHo New York City. Dimensions can vary according to site, at HEREArt Gallery it was 100 cm x 100 cm (ca. 45" x 45"), Materials: ground coffee and refined commercial sugar. The installation - true to its claim of being a mandala - was distroyed after the show. I choose coffee and sugar as symbols for an European culture that often quite ruthlessly destroyed foreign civilizations. Coffee and sugar are both plants that the Europeans brought to the Americas, for Central America's tropical garden Eden presented ideal conditions for their cultivation. However, for the continent's native American Indian inhabitants coffee and sugar meant enslavement and the loss of homeland and culture. So And Sweet as Love - Mandala of Peace and Passion pays respect to the ancient continent of America and wants to be a memorial for peaceful integration of different cultures. The form chosen for the installation calls upon various associations such as that of the international peace symbol; the image of "Turtle Island" - the name the native American tribes called their continent; and that of a very archaic drawing of the feminine body, an image found by archeologists worldwide and thus connecting all cultures. Discovered as early as 800 A.D. in the Ethiopian highlands, cultivation and trade of coffee did not begin until the 15th and early 16th centuries on the Arabian peninsula, especially Yemen, Egypt, Syria and Turkey. The Arabians eagerly guarded and protected their increasingly valuable plant and as late as the 1900's having fertile coffee beans for export was considered a crime in most coffee growing countries. Today it is the world's most popular beverage after water, a world commodity second only to oil. Coffee has always stirred much controversy. While the Ethiopian monks considered it as a gift from God - it allowed them to study and pray longer - Italian clergy labeled it an invention of Satan and condemned coffee during the 17th century. (It was probably coffee's proven effect of increasing mental and intellectual activity what made it suspicious to rulers and religious leaders.) However, this label was forever lifted when Pope Clement VII tried the beverage for himself, liked it and gave it his approval. "Coffee is the beverage of choice for the journalist or writer... By drinking coffee, logical consistency, consecutive thinking derived from facts, is promoted by physical means, and it can be said that even though for health reasons there may be doubts about drinking much coffee, yet for those who wish to ascend to the higher regions of spiritual life, it is not amiss." It is thought that cane sugar was first used in Polynesia from where it spread to India. Persia, and North Africa. Columbus' discovery of the Americas made the Europeans independent from expensive imports of the pleasant "white gold". Some people consider cheap sugar the (American) "Indians' Revenge" for stealing their entire continent: Today, refined sugar is considered the main cause of most modern diseases. "Sugar is the substance which inwardly supports us... and gives self-awareness and... a very strong and definite personality indicating a strong Ego. In countries where, statistically, little sugar is eaten, the people have a less defined personality than in countries where more sugar is eaten." Mandalas (Sanskrit for circle) are an ancient (art) form of Tibetan Buddhism. Classically mandalas are drawings in three dimensional forms most commonly created of colored sand, powdered flowers, herbs or grains, and also powdered and colored stone. When finished, to symbolize the impermanence of all that exists, the sands are swept up and poured into a nearby river or stream where the waters carry healing energies throughout the world. Ethno botanical installation executed for Eat Art 5, December 1st, 2002 in HEREArt Gallery, SoHo, New York City, USA.